One of the issues highlighted by the election, and all the noise surrounding it, is a growing lack of civility in our society. There are plenty of examples of the ingredients contributing to its continuing decline. Facebook has curated content to fill people’s timelines with stories that affirm their existing opinions. Social media itself has become a venue for debate, often taking the place of face to face interaction, and removing the relational element of conversation. There is an increasing saturation of fabricated “news” available that is consumed without critique. Some educational institutions tend toward entrenching a specific set of ideas rather than promoting disagreement. Neighbors pass each other, but hardly know each other’s names, let alone their convictions. In many ways, society has been working against civility and we are seeing the fruit of this work. This is problematic for society as a whole, and certainly for Christians. 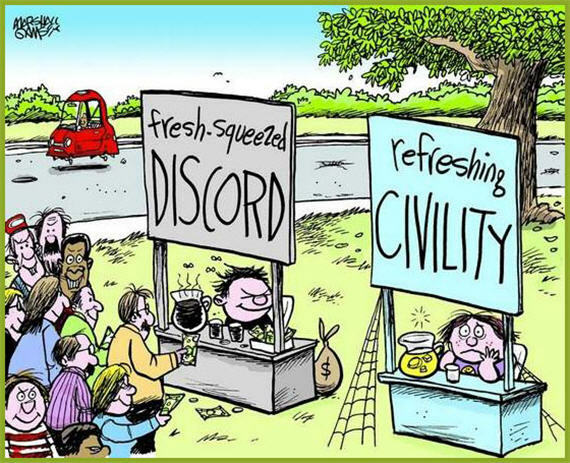 Civility is a mark of a flourishing free society. It is a necessary ingredient of the pursuit of the common good. It buoys us against the degradation of “the other.” It is a check against a decline toward a less free society. In short, the corrosion of civility is a contributing factor to the frustration of flourishing. While civility is not tethered to a single environment, the workplace has significant promise as one place where it can be cultivated. I wonder if this is something we are inspiring in the people we’re leading. This is not an aspect of the faith and work message I’ve heard regularly, but it is an important one because of the importance of civility. As we work with ideas and people, there are a few reasons to promote the workplace as an environment for cultivating civility. First, the workplace brings people of varying beliefs and convictions together in a single place (whether physically or virtually). While it is true that some occupations tend to draw those of similar convictions, it is uncommon to find total homogeneity. This means each worker has the opportunity to hear the opinions and convictions of those with whom they disagree. This does take intentionality. In many cases people can show up and do their job without knowing the people around them. But this hardly seems tenable for a Christian worker. Simply by asking a few questions, and actually listening to the answers, people have a wonderful opportunity to build relationships with those of differing convictions. Second, the workplace keeps people together after disagreement. Let’s say a staunch liberal and staunch conservative have a heated debate. They get frustrated and don’t want to interact with each other again. However, the next day, or the next week, they will have to interact to fulfill the mission of their organization. They may not go directly back to conversation about convictions, but the relationship is nearly required to continue despite their run-in. This gives the Christian worker an opportunity to live out the call to forgiveness and reconciliation–working toward a true relationship with the one with whom they disagree. Finally, the workplace offers a shared purpose as a point of unity. In a couple of different work settings I have experienced the power of that shared purpose. There are people I’ve had as coworkers who I didn’t like much (and I’m sure they didn’t care for me). However, when we focused on the work to be done and the purpose for which we were doing it, we found that we were able to develop a civil relationship. We didn’t become best friends, but we weren’t constantly “at” each other either. In the midst of differing opinions and convictions, the mission of a workplace offers a foundation on which to build civility. Because of the importance of civility for the flourishing of society, and the promise of the workplace as an arena for cultivating it, it is important to consider this in how we think about faith and work. How will we weave this into our thinking and communication? What role will this play in our drive toward a Christian foundation on which a more just, whole, and healthy society can be built? This is a great reminder Trevor! It made me think though that as Christians we can go beyond civility to real respect and care for our co-workers (customers, et al). Taking a moment to greet our colleagues and take interest in their life as well as work is a gift from God.